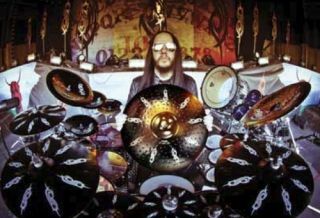 Paiste has teamed up with Joey Jordison and Vinnie Colaiuta on two new sets of cymbals. The Slipknot sticksman has collaborated with the cymbal maker to launch the Black Alpha Hyper line. The cymbals contain Paiste's black ColorSound coating and each cymbal features nine silver placed Tribal-S logos. Unique and deep hammer marks. The range includes 14" Hyper hats, 16", 17" and 18" crashes, 18" China, 20" ride and a 10" splash. A set packed with 14" hats, 10" splash, 16" crash and 20" ride is available now. Paiste has also been hard at work on brand new Formula 602 models. These cymbals have been created with the help of Vinnie Colaiuta. The added cymbals are, 15" Medium hats, 24" Medium ride and 22" Thin crash. For more on both ranges visit www.paiste.com.